Site: Homewood Field; Baltimore, Md. 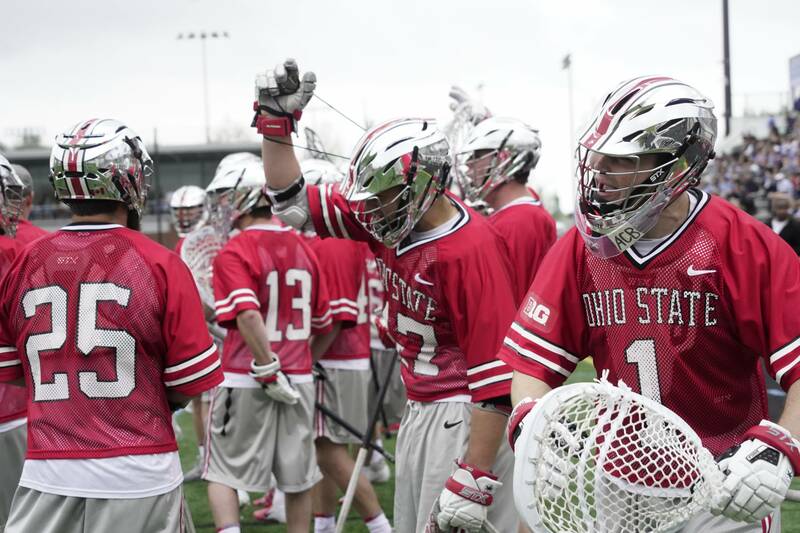 Did You Know: Ohio State overcame a five-goal second half deficit for the second time in the last four games. BALTIMORE – Eighth-ranked Ohio State picked up its first Big Ten win of the season in dramatic fashion on Sunday, erasing a six-goal first half deficit and scoring the game-winning goal with 49 seconds remaining for a 14-13 victory at No. 15 Johns Hopkins. The Buckeyes – who improve to 8-2 overall and 1-2 in the B1G – also were victorious at JHU’s Homewood Field for the first time in program history. 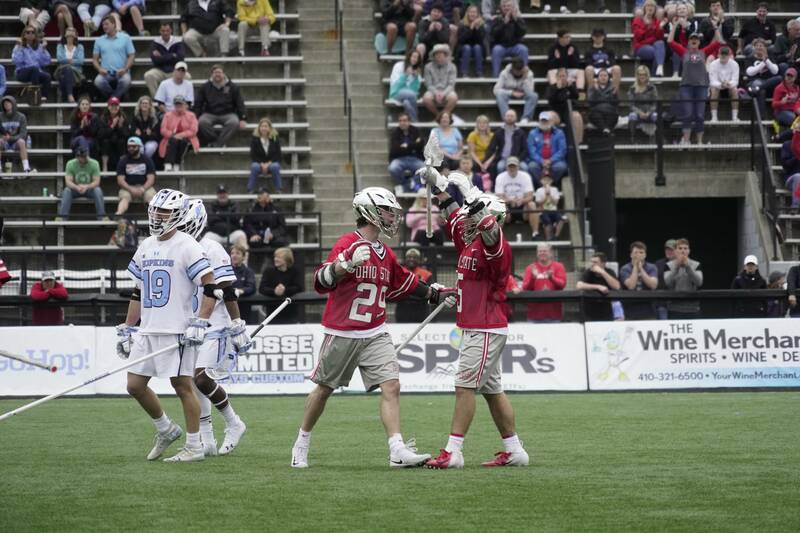 Jackson Reid scored five goals – including the game-clincher with under one minute to play – and Tre Leclaire and Johnny Wiseman backed up his efforts with hat tricks to lead a balanced Ohio State offensive effort. The Buckeyes outscored Johns Hopkins (6-5, 2-1 B1G) 11-5 in the second half and won 10 of the game’s final 11 face-offs. On defense, goalie Josh Kirson made what proved to be a pivotal play late in the fourth quarter when he saved a JHU shot on the Blue Jays’ final possession. His pass to Logan Maccani after the save led to the game-winning goal in transition from Reid. Head coach Nick Myers: “Hats off to Coach Pietramala and a great Hopkins team. I loved the way our men responded in the second half to being challenged. We got a lot of contributions from a lot of different people and that’s what it takes to win big games on the road. • Johns Hopkins got off to a 2-0 lead in the first seven minutes of the first quarter following goals by Alex Concannon and Kyle Marr. Shortly after Marr made it 2-0 for the Blue Jays, goalie Josh Kirson made a key save on a Marr shot, leading to a transition goal that resulted in a finish by Jackson Reid. • JHU’s Luke Schilling closed out the first quarter scoring when he converted an extra-man opportunity with 6:20 to play in the opening stanza. • Johns Hopkins scored twice in the first four minutes of the second quarter to build a 5-1 lead, both coming from Concannon. His second of the period – at the 12:02 mark – came on an extra man opportunity. • Freshman Johnny Wiseman broke the Buckeyes’ scoring drought at the 8:42 mark of the second quarter to make the 5-2 in favor of Johns Hopkins, but the Blue Jays’ Joey Epstein netted back to back unassisted tallies in just over one minute to give JHU a 7-2 advantage. • The Blue Jays opened a 8-2 second-quarter lead on a Kyle Marr goal – his second of the half – but Jack Jasinski closed out the first half with a score off a pass from Leclaire. • Ohio State scored seven times in the third quarter to come all the way back from its five-goal halftime deficit. JT Bugliosi started the rally early – just one minute into the quarter – and that was followed by a Reid goal coming off a feed from Jack Myers. JHU’s Concannon netted his fourth goal of the game to give the Blue Jays a 9-5 lead, but the Buckeyes went on a 5-0 run over the next five minutes to grab their first lead of the game. • Leclaire scored twice in the rally sandwiched around goals from Wiseman, Reid and Jasinski. The Blue Jays tied the game at 2:56 of the quarter thanks to a Joey Epstein goal and then scored as the third quarter buzzer sounded to take an 11-10 lead. 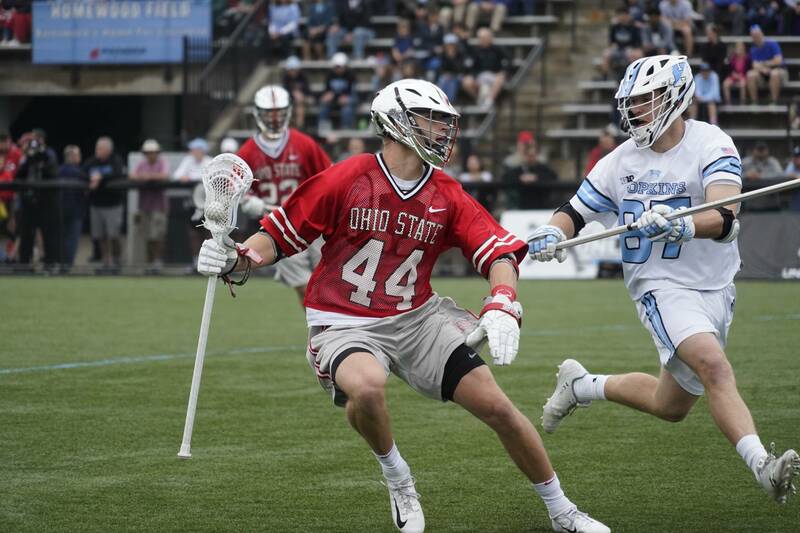 • Johns Hopkins’ Jack Keogh gave the Blue Jays a 12-10 lead with just over 11 minutes remaining, but Ohio State answered back with three unanswered – one from Leclaire, Wiseman and Reid respectively – to take a 13-12 lead. Cole Williams tied the score at 13-all with 2:02 to play before Reid buried the game-winner in transition at 52 seconds. • Inacio was victorious on the key face-off following Reid’s goal and Ohio State was then able to run out the clock. • Tre Leclaire has multiple goals in all 10 games this year. He leads the team with 31 goals this season. • Jasinski scored a goal for the 16th time in the last 17 games. 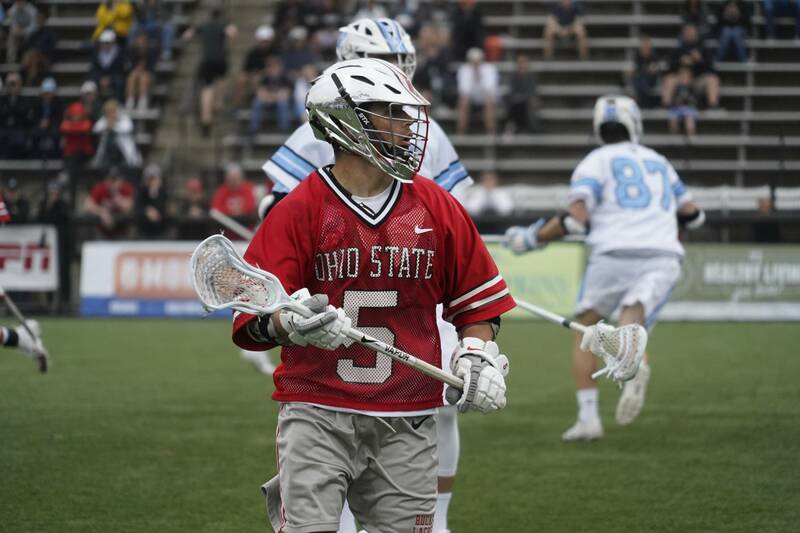 • Ohio State’s six-goal comeback against Johns Hopkins was the largest against the Blue Jays since 2003, a span of 16 seasons. • Ohio State’s five-goal second half comeback is its second this year. It defeated Notre Dame 11-10 in overtime on March 23 after trailing 7-2 in the third quarter. Prior that that, the Buckeyes had last overcome a five-goal or more deficit against Towson in the 2017 NCAA Semifinals. • Wiseman’s hat trick was the first of his career. • In addition to winning 10 of the last 11 face-offs, Inacio was victorious in 14 of 26 overall in the X against JHU’s Kyle Prouty, who came into the game ranked in the top 10 nationally in face-of win percentage. Inacio won six of seven in the fourth quarter to fuel the Ohio State rally. 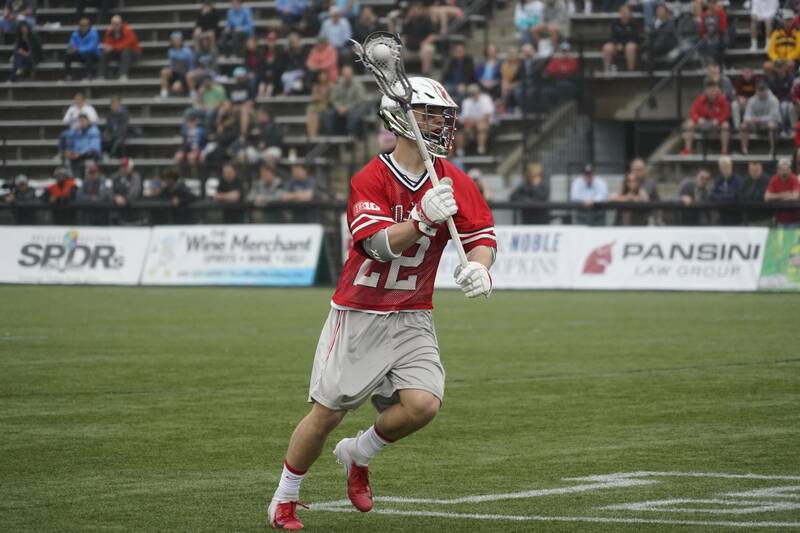 • The Buckeyes scored five transition goals on the afternoon and had assists from defensive players Ryan Terefenko, Logan Maccani and Joey Salisbury. • Ohio State finished with more ground balls than its opponent for the ninth time in 10 games. • The 49 shots generated by the Buckeye offense was a season high. • Kirson, who finished with 12 saves, registered double digit stops for the sixth time in nine starts. Ohio State returns home next Saturday for its final regular season game of the season in Ohio Stadium against No. 3 Maryland beginning at 1 p.m. Prior to the game, the Buckeyes will honor their senior class.